TS New DR @25.676% GO.56 Dt: 17-05-2018 Dearness relief 1.572% Sanctioned to TS pesioner, retired employees from 1st July 2017 by Telangana State Government. Government hereby order the revision of Dearness Relief to pensioners sanctioned in the G.O. 11th above from 24.104% of the pension to 25.676% w.e.f 01.07.2017 in respect of (i) Those who retired from service after 01.07.2013 and are drawing pension in the Revised Pay Scales, 2015. (ii) Those who retired prior to 01.07.2013 and whose pension was consolidated in the light of orders issued in the G.O. 3rdread above. 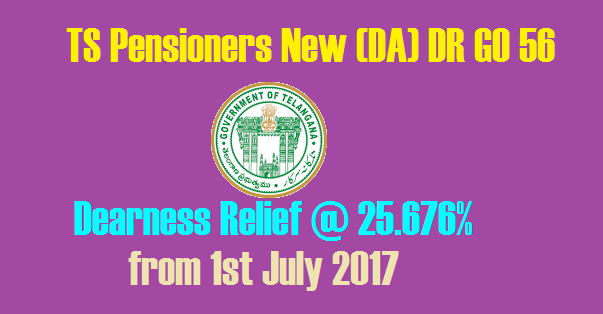 Pension–Dearness Relief to Pensioners with effect from 01.07.2017 –Revised– Orders issued. 5. G.O.Ms.No.130 Finance (HRM.V) Department dt.16.09.2015. 11. G.O.Ms.No.61 Finance (HRM.V) Department, Dt.22.04.2017. (i) Those who retired from service after 01.07.2013 and are drawing pension in the Revised Pay Scales, 2015. (ii) Those who retired prior to 01.07.2013 and whose pension was consolidated in the light of orders issued in the G.O. 3rdread above. 2. Government also hereby order the revision of rate of Dearness Relief from 102.72 % to 105.288% with effect from 01.07.2017 to the pensioners who are drawing their pension in revised pay scales, 2010 and not consolidated in terms of the orders issued in the reference 3rd read above. 3. Government also hereby order the revision of rate of Dearness Relief to the pensioners who retired while drawing UGC Pay Scales 2006 from 01.01.2006 from 136% to 139% w.e.f. 01.07.2017. 4. Government also hereby order the revision of rate of Dearness Relief to the pensioners/family pensioners whose pension was consolidated as per orders issued in G.O.Ms.No.54, Higher Education (UE.II) Department, dated.08.06.2011 and G.O.Ms.No.31, Higher Education(UE.II)Department,dated.24.05.2013 from 136% to 139% with effect from 01.07.2017. 5. Government also hereby order the revision of rate of Dearness Relief sanctioned vide G.O.Ms.No.4, Law (Law & J-SC.F) Department, dated.06.0 1.2011 to the Pensioners who a r e drawing pension as per Justice E.Padmanabhan C o m m i t t e e report from 136% to 139% with effect from 0 1 -07-2017. Finance & Planning (FW-Pen.I) Departmentdt. 16.11.1971, G.O.Ms.No. 104 Finance & Planning (FW-Pen.I) Department dt. 13.04.1973 and G.O.Ms.No.25 Finance & Planning (FW- Pen.I) Department dt. 02.02.1974. (3) Pensioners governed by the Telangana Revised Pension Rules, 1980. 7. These orders are not applicable to Financial Assistance grantees and others who are not entitled to Dearness Relief. 8. The amount of Dearness Relief shall be rounded off to the next rupee. 30-04-2018 shall be claimed along with the pension of June 2018 payable in the Month of July 2018. 11. All the Treasury Officers/Pension Payment Officers shall workout and make payments of the Dearness Relief on Pension sanctioned in this order in terms of orders issued in G.O.Ms.No.122 Finance (Pen.I) Department, dt.22.05.2014. 12. The expenditure is allocable among the various States in accordance with provisions of Rule 24 of the Incidence of Pension Rules in Appendix III-B of the Telangana Accounts Code, Volume-I. illa Parishads and Pension Funds of the respective Municipal Councils. 14. In respect of the Pensioners of the Universities the expenditure on account of the Dearness Relief now sanctioned above shall be met from the Block Grants allotted to them. 15. The G.O is available on Internet and can be accessed at the address http://goir.telangana.gov.in. TS New DR @25.676% GO.56 Dt: 17-05-2018 Dearness relief 1.572% Sanctioned to TS pesioner, retired employees from 1st July 2017 by Telangana State Government.